Emperor En'yū (円融天皇, En'yū-tennō, 12 April 959 – 1 March 991) was the 64th emperor of Japan, according to the traditional order of succession. En'yū's reign spanned the years from 969 through 984. Before his ascension to the Chrysanthemum Throne, his personal name (imina) was Morihira-shinnō. Morihira-shinnō was the fifth son of Emperor Murakami by the empress consort Anshi, the daughter of Fujiwara no Morosuke, therefore the brother of Emperor Reizei. In 967, Morihira-shinnō was appointed as the crown prince, bypassing his elder brother by the same mother, since his brother had no support from the Fujiwara clan. En'yū had five Empresses or Imperial consorts and one Imperial son. 27 September 969 (Anna 2, 13th day of the 8th month): In the 3rd year of Emperor Reizei's reign (冷泉天皇三年), he abdicated; and the succession (senso) was received by a younger brother. 5 November 969 (Anna 2, 23th day of the 9th month): Emperor En'yu is said to have acceded to the throne (‘‘sokui’’). 8 June 976 (Ten'en 2, 11th day of the 5th month): The Imperial Palace burned down; and the Sacred Mirror was blackened to such an extent that it reflected no light. 31 December 980 (Tengen 3, 22nd day of the 11th month): The Imperial Palace burned down; and the Sacred Mirror was half destroyed. 5 December 982 (Tengen 5, 17th day of the 11th month): The Imperial Palace burned down; and the Sacred Mirror was reduced to a lump of melted metal which was collected and presented to the emperor. In his reign there were a severe struggle between the Fujiwara clan over who would be appointed kampaku. Emperor En'yū followed his mother's advice and favored Fujiwara no Kanemichi, his maternal uncle. He had only one son, later the emperor Emperor Ichijō by Senshi, a daughter of his uncle Fujiwara no Kaneie, who was another brother of his mother. He made the daughter of Kanemichi the empress consort, though she bore no children. Senshi and her father Kaneie were angry at this elevation of their rival and were absent from the court for a long time, staying at the mansion of Kaneie with the child. Imperial processions to the Hachiman and Hirano Shrines were first made during the reign of Emperor En'yū. 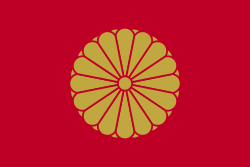 24 September 984 (Eikan 2, 27th of the 8th month): The emperor abdicated at age 26. 16 September 985 (Kanna 1, 29th of the 8th month): The former-Emperor En'yū took the tonsure, becoming a Buddhist priest and taking the name of Kongō Hō. 1 March 991 (Shōryaku 2, 12th of the 2nd month): En'yū, now known as Kongō Hō, died at age 32. The actual site of En'yū's grave is known. This emperor is traditionally venerated at a memorial Shinto shrine (misasagi) at Kyoto. The Imperial Household Agency designates this location as En'yū's mausoleum. It is formally named Nochi no Mukarami no misasagi. Kugyō (公卿) is a collective term for the very few most powerful men attached to the court of the Emperor of Japan in pre-Meiji eras. Kampaku, Ōno-no-miya Fujiwara no Saneyori (藤原実頼), 900–970. Kampaku, Fujiwara no Yoritada (藤原頼忠), 924–989. Sesshō, Fujiwara no Koretada, 924–972. Udaijin, Fujiwara no Kaneie (藤原兼家), 929–990. Udaijin, Fujiwara no Kanemichi, 925–977. The years of En'yū's reign are more specifically identified by more than one era name or nengō. ↑ Ponsonby-Fane, Richard. (1959). The Imperial House of Japan, p. 71. ↑ Titsingh, Isaac. (1834). Annales des empereurs du japon, pp. 144–148; Brown, Delmer et al. (1979). Gukanshō, p. 299-300; Varely, H. Paul. (1980). Jinnō Shōtōki, pp. 191–192. ↑ Titsingh, p. 144; Varely, p. 191; Brown, p. 264; prior to Emperor Jomei, the personal names of the emperors were very long and people did not generally use them. The number of characters in each name diminished after Jomei's reign. 1 2 3 4 5 6 7 8 Brown, p. 300. ↑ Titsingh, p. 143; Brown, p. 299; Varley, p. 44; a distinct act of senso is unrecognized prior to Emperor Tenji; and all sovereigns except Jitō, Yōzei, Go-Toba, and Fushimi have senso and sokui in the same year until the reign of Emperor Go-Murakami. ↑ Titsingh, p. 144; Varley, p. 44. 1 2 3 4 5 6 7 8 Brown, p. 299.